On March 19, 2019, "Immunity" magazine officially published the paper "Specific Decrease in B Cell-Derived Extracellular Vesicles Enhances Post-Chemotherapeutic CD8+ T Cell Responses" by research teams of Professor Zhijian Cai and Professor Jianli Wang of Zhejiang University, revealing the important role of CD19+ extracellular vesicles (EVs) in immunosuppression after chemotherapy, which provides a new idea for improving the anti-tumor effect of chemotherapy. Chemotherapy is currently one of the most effective means of treating cancer. However, chemotherapy has long been associated with the induction of systemic immunosuppression. Many chemotherapeutic drugs are myelosuppressive agents that inhibit the production of blood cells in the bone marrow, reduce absolute white blood cell counts, and cause lymphopenia. Tumor-specific CD8+ T cells are the most important effector cells for killing chemotherapy-resistant or residual tumor cells after chemotherapy, which effectively prevents tumor recurrence after chemotherapy. However, the systemic immunosuppression associated with chemotherapy greatly limits the activation of tumor-specific CD8+ T cells, ultimately leading to failure of chemotherapy. Therefore, to further elucidate the mechanism of systemic immunosuppression after chemotherapy is of great significance for improving the effect of chemotherapy and preventing tumor recurrence. Apoptotic tumor cells induced by chemotherapy can release large amounts of ATP extracellularly in a short period of time. How such a large level of ATP is dealed with and its effect on anti-tumor immunity are still unknown. CD39 is an exonucleoside triphosphate dihydrolase 1 that hydrolyzes ATP to ADP or AMP. CD73 is a 5-host nucleotide hydrolase that hydrolyzes AMP to adenosine. Adenosine is a potent immunosuppressive molecule that inhibits the activation of CD8+ T cells. Research teams of Professor Zhijian Cai and Professor Jianli Wang found that CD19+ EVs released by B cells contain high levels of CD39 and CD73, which can hydrolyze ATP released by chemotherapeutic drugs to adenosine, inhibiting activation of CD8+ T cells after chemotherapy, thereby impairing the anti-tumor effect of chemotherapy. They also found that although CD19+ EVs in tumor mice and normal mice contain similar levels of CD39 and CD73, and show similar ability to hydrolyze ATP and inhibit anti-tumor effects of chemotherapy. However, B cells of tumor mice are able to release more levels of EVs than normal mice. Further studies have shown that the tumor microenvironment can up-regulate the protein level of HIF-1ɑ in B cells, and then HIF-1ɑ directly binds to the promoter of Rab27a gene, promotes the expression of Rab27a protein, and finally promotes the secretion of CD19+ EVs. Similarly, higher levels of CD19+ EVs were detected in sera of tumor patients in different phases compared with healthy individuals, and patients with lower levels of CD19+ EVs showed better chemotherapy effects, suggesting the significance of serum CD19+ EVs in tumor diagnosis and evaluation of chemotherapy effect. To further reveal the effect of CD19+ EVs on chemotherapy, research teams of Professor Zhijian Cai and Professor Jianli Wang constructed mice with B-cell-specific deletion of the Rab27a gene. In tumor conditions, the B cells of these mice did not increase release of CD19+ EVs. Moreover, the activation of CD8+ T cells in these mice was significantly enhanced after chemotherapy, and even tumors could completely disappear in half of these mice. In addition, research teams of Professor Zhijian Cai and Professor Jianli Wang also linked their findings to clinical applications. By using the character of Epstein-Barr virus (EBVs) specifically infecting human B cells, they introduced Rab27a siRNA into inactivated EBVs (Rab27a siRNA/iEBVs) and specifically inhibiting Rab27a protein expression in B cells of humanized NSG mice. They found that Rab27a siRNA/iEBVs significantly enhanced the anti-tumor effect of chemotherapy and increased the number of CD8+ T cells in humanized NSG mice. The study finds a new mechanism for immunosuppression mediated by CD19+ EVs after chemotherapy and confirms the prospects for clinical application of Rab27a siRNA/iEBVs in combination with chemotherapy. In the same issue, "Immunity" magazine published a preview entitled "Exosomes Exercise Inhibition of Anti-Tumor Immunity during Chemotherapy" by Professor Raghu Kalluri, Director of the Department of Cancer Biology at MD Anderson Cancer Center, giving positive comments on this study. 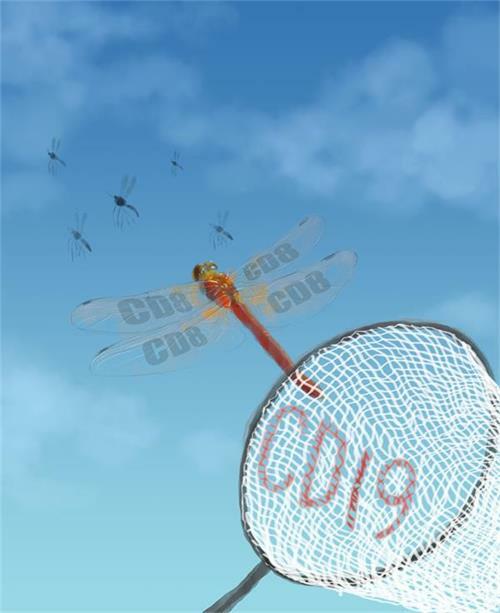 Figure legend: The dragonfly (CD8+ T cells) is happily preying on mosquitoes (cancer cells). The terrible thing is that the net bag (CD19+ EVs) behind is about to catch it.